German Chocolate Cake is my dearest Uncle Michael's favorite dessert ever. So when we took a little road trip to see him over the holidays, I knew what I had to do. I used a recipe from Martha Stewart's Cupcakes, but filled them from a hole on top instead of slicing horizontally and filling them layer-cake style like Martha does. To make the hole, I used a new trick I learned in my cake decorating class. Dig the wide end of a large metal decorating tip into the center of the cupcake. Voila, big hole! And a donut-hole-like snack to boot. I like the injection method too, but this way is infinitely better for chunky frosting like this Coconut Pecan yumminess. These were a bit over-the-top sweet, but not in a bad way. Even if you don't normally seek out coconut-y things, it's pretty much impossible not to love these. 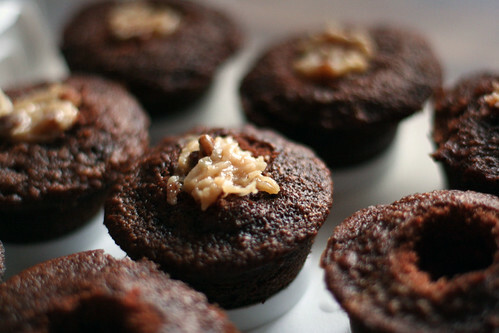 The base chocolate cupcake recipe is moist and really versatile too, if you don't believe me or aren't in the mood for opening your mind to German Chocolate bliss. By the way, did you know that German Chocolate cake isn't from Germany at all? The recipe was submitted to a newspaper by a homemaker in Dallas in 1957. It used Baker's brand "German's Sweet Chocolate" as an ingredient (source), and the name was born. 1. Preheat oven to 350 degrees. Brush standard muffin tins with butter; dust with cake flour, tapping out excess, or spray generously with nonstick baking spray. Whisk together cake flour, baking soda, and salt. 2. With an electric mixer on medium-high speed, cream butter and sugar until pale and fluffy. Add eggs, one at a time, beating until each is incorporated, scraping down sides of bowl as needed. Beat in vanilla. Reduce speed to low. Add flour mixture in three batches, alternating with two additions of buttermilk, and beating until combined after each. Beat in chocolate until combined. 3. Divide batter evenly among prepared cups, filling each three-quarters full. Bake, rotating tins halfway through, until a cake tester inserted in centers comes out clean, 20 minutes. Transfer tins to wire racks to cool 10 minutes. Run a small offset spatula or knife around the edges to loosen; turn out cupcakes onto racks and let cool completely. Cupcakes can be stored up to 3 days at room temperature in airtight containers. 4. To finish, make a hole in the top of each cupcake with a spoon or wide end of metal decorative icing tip. Fill hole with frosting and spread more on top. 1. Combine egg yolks, evaporated milk, and brown sugar in a saucepan. Add butter, and cook over medium heat, stirring constantly, until thick, about 10 minutes. Pour through a fine sieve into a bowl. 2. Stir in vanilla, salt, coconut, and pecans. Let cool completely. Frosting can be refrigerated in an airtight container for up to 1 day; bring to room temperature before using. German Chocolate Cake is one of my favorites! Wow these look delicious! My mother has always asked for German Chocolate cake for her birthday as long as I can remember, I'm going to have to test these out on her! 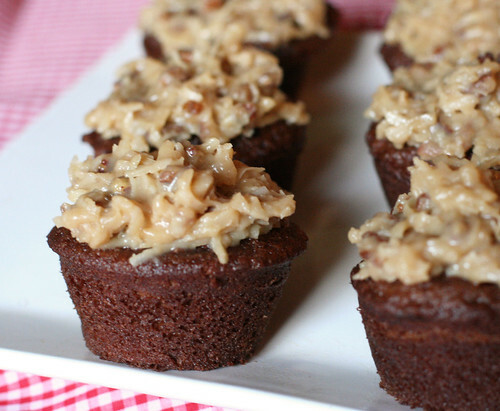 I just made a German Chocolate birthday cake for myself, and am STILL inclined to try these out today. They look sooo yummy! German chocolate cake is my mom's favorite dessert, too! I'm totally going to make these for her birthday this year. They look great! I've been staring at these all day. Seriously, I think I've opened the page 5 times. I've never had german chocolate cake, but it sure sounds heavenly. These look good and you Wilton flowers are gorgeous! So glad I found your site, very cute!! I'm definitely going to have to try these; GCC is my dad's favorite! ps. your minis look adorable!! So my kind of thing :) I will have to make these! Wow! I've never had German chocolate cake before...but it looks like something I would love!! yours looks AMAZING!!! And your photos are gorgeous! I also have never had German Chocolate cake and am dying to try it after hearing so many good things about it. Maybe I'll finally have the chance to try it when (not if) I make these cupcakes. It's a lot easier than baking an entire cake and a little more portion friendly. Fabulous! I will make these soon. I have been making mini-cupcakes recently. I find that freezing them, and then cutting out the centers with an apple-corer works well. I may fill with ganache, to off-set the sweetness of the topping. My favorite German chocolate cake recipe, on Epicurious, is Inside out German Chocolate cake. It uses dulce de leche as a base for the filling, which goes between the layers, instead of on top. Then the whole cake is frosted with ganache, hence the idea to fill with ganache. It's a great flavor combo. German chocolate cake rocks! Your cupcakes are cute and I like the idea of filling them rather than layering the frosting in the cake. How do your cupcakes look so dark & rich? Mine turned out as previous post, light & fluffy. Did not come out of tins very easily. Would not repeat this recipe. I have a better chocolate cupcake recipe that I'd use and just put the traditional pecan frosting on to give the german cupcake taste. @Anonymous Thanks for your comment. Not sure how/why ours came out so differently, and I'm sorry it didn't work out for you! Glad you have a different recipe to use next time. Re: sticking to the pan, I highly recommend a generous spray of non-stick baking spray with flour (like Baker's Joy or Crisco brand with Pillsbury flour) in each cup of the pan. Thanks again for your feedback. We made these this afternoon. Very simple to make with ingredients I had on hand and delicious! Thanks for sharing the recipe.